These Indonesian Jeweled Sterling Silver Armor Earrings are hand crafted from exceptional quality materials. 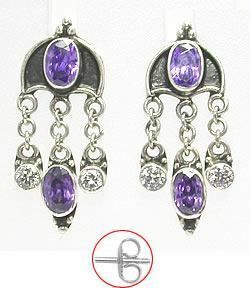 These unique earrings have two purple jewels on sterling silver backings connected by a sterling silver dangle, as well as two other dangles with crystal jewels. Check out this matching Armor Purple Bali Belly Button Ring.